Sometimes, the most modern building trends are so successful because they make use of something that’s been around well before architects started designing. We’re talking about natural light, of course, that element that can totally transform the appearance of a building. If you’re searching for a design that employs natural light in a way that no other construction method can, you should consider a facade system. Natural light doesn’t just enter a designed building without careful advance planning. The architect who designs a building deliberately considers the placement of the light by accommodating the angles where the sunlight will appear in the structure at various times during the day. By tapping into the bounty of natural light, that wonderful resource that is available virtually on demand, the architect channels its beautify and its usefulness into a well-planned design. A facade system will bring a level of beauty to your building that other exteriors can’t match. But at the same time, facade systems are durable. They have to be if they’re going to protect a building from the impact of weather. Rain, snow, wind, hail, and even sun all have the power to weaken and damage the structure over time. But facade systems are designed with strength in mind so that they stand up to everything that Mother Nature can send. Different climates will call for different facade systems; what works for a building in a hot, sunny region won’t suit a building in a damp, rainy location. But the versatility of facade systems means that there’s one that’s just right for you. Buildings have specific functions that require conforming to the template of the structure’s purpose. A gymnasium isn’t going to have the same purpose as a library, and the two buildings won’t be identical. Any building needs to meet certain regulations and codes and as environmental issues have become more of a universal concern, these requirements are reflected in the way buildings are designed and constructed. Facade systems please the public because their energy efficiency is a vital part of the sustainable life style that people practice. But there’s one area where codes and rules aren’t the driving force behind the design and that is in the creativity that facade systems unleash. If you’re bored by the way so many buildings seem to be designed with a cookie-cutter format, each one looking the same as the one before it, you’re going to appreciate the unbelievable freedom that facade systems offer. With facade systems, the function of a building doesn’t trap it inside a boring format that just repeats what everyone else is building. Functionality is vital for any building, but it doesn’t need to inhibit the potential of a structure to be visually appealing. Danpal’s facade systems allow a structure to perform its intended function while nurturing the people who work and live inside it. Every building, whatever its intended purpose, is part of a neighborhood and that neighborhood is a community. People who go about their daily business are uplifted when they have the opportunity to enjoy beauty that improves the environment in a holistic way. By choosing a Danpal facade system, you’re making your part of the world a better place. Danpal® Facade systems come in a variety of colors, finishes and special effects, providing a dazzling array of creative options. These translucent, dry-glazed systems are available in a wide range of configurations suitable for various types of structures. Lightweight with superior flexibility, Danpal® facades provide high-impact protection from the elements in a variety of climates, particularly in comparison to glass. Transparency, combined with the balance of light and thermal dynamics for any facade, creates an appearance that’s esthetically pleasing and tough enough to handle the outdoor elements. 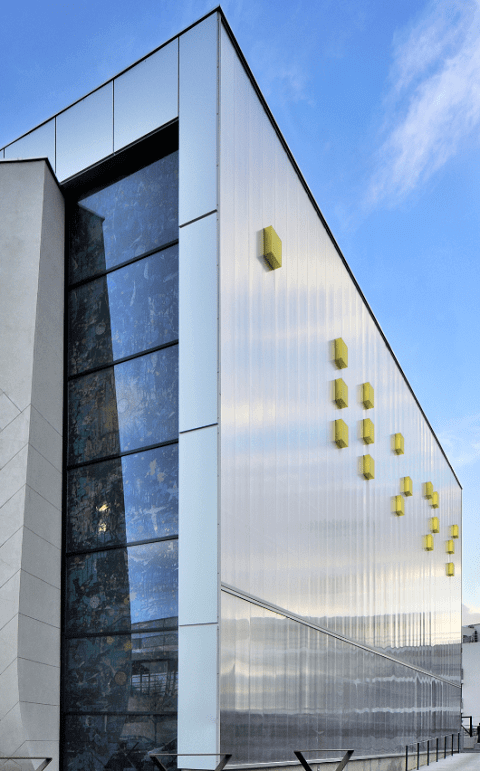 What are the Benefits of the Danpal® Facade Systems? Natural light pleases the eye but Danpal® facade systems takes beauty one step further with glazing panels that evenly diffuse that light while accommodating the architectural application of daylight through tight spacing in between the ribs. The artistry of the colors, textures, finishes, and effects delivers a glorious palette of options that illuminate by day and turn into light boxes at night. Being tough enough to handle the great outdoors means that the panels, with their Microcell structure, are built to resist damage from hail. And while we’re talking about the elements, you’ll appreciate the fact that the Danpal® facade system boasts co-extended UV protection that guarantees a longer system life. Mother Nature doesn’t always play by the rules, but that’s okay, because with the snap-lock connection system, air and water won’t be able to penetrate the building. The structure is versatile enough to adapt, with concealed joints that create a flush external that can twist if necessary. Beauty counts, but so does comfort, and the façade system’s superior thermal insulation improvements in ‘U’ and ‘R’ values enhance the building’s overall energy efficiency. The design can control the amount of light, conceal building features, or reveal fascinating visual contrasts, thanks to the integration with conventional glazing. Installation is easy and cost-effective and the system complies with SO9001 and CSTB requirements. The Thermal Advanced AirPT System provides integrated subsoil and frame and thermal break to deliver advanced performance. The Advanced NM System is an advanced face system with an integrated frame. The Traditional TP system is an economical façade system that delivers basic performance without a sub frame. With 50 years of expertise and innovation in light architecture, Danpal® can be confident that it has not only blazed the trail that others can only follow, but its façade systems have also remained on the cutting edge. The company’s vision guides everything it does to create state-of-the-art systems that make it possible for architects to transform both artificial and natural light into an architectural tool to enhance creativity. A global company that operates on five continents, Danpal® and its five regional subsidiaries employ global distribution and operation to supply the world with the latest in tailor-made daylighting for façade systems. Even the world’s best architects appreciate the inspiration that the Danpal® façade systems generate as the panels turn daylight itself into a creative building tool. Whether it’s the engineering, the design, the comfort or the esthetics, Danpal® solutions meet the most stringent requirements, as well as energy efficiency, to help conserve the world’s natural resources. There seems to be confusion in some circles relating to the translucent facade, and it’s purpose. Considering that, we wanted to release a blog post that will set the record straight. We’ll highlight the type of professionals who might use the product, and some of the benefits they can expect. Hopefully, this post will encourage more people to make better use of the solution. As you will learn, it can add alluring design elements to any building while also providing structural advantages. So what is a translucent facade? Translucent facades are glazing panels used on the exterior of buildings. They help to protect the construct from weather damage, damp, and erosion. They come in a broad range of different colors and styles to suit every job. Many architects use them to improve the aesthetics of their design. By fixing them in place, it’s possible to hide unsightly building elements and create the perfect finish to any property. The products can assist in protecting people from harmful UV rays. They also ensure maximum thermal conduction. Individuals who use them will notice a reduction in energy bills because they use the sun’s natural light to heat and illuminate buildings. So what are some of the other benefits? We already mentioned that a translucent facade could help to protect buildings from weather damage. That is because the product creates a seal that stops penetration by water and air. They are also durable, and so they can withstand impact from hail and other unwanted elements. The materials offer super flexibility, and that is why they can last for many years. As a building becomes hot or cold, the products will expand and contract. They also come in many different styles and shades to suit almost any building design. 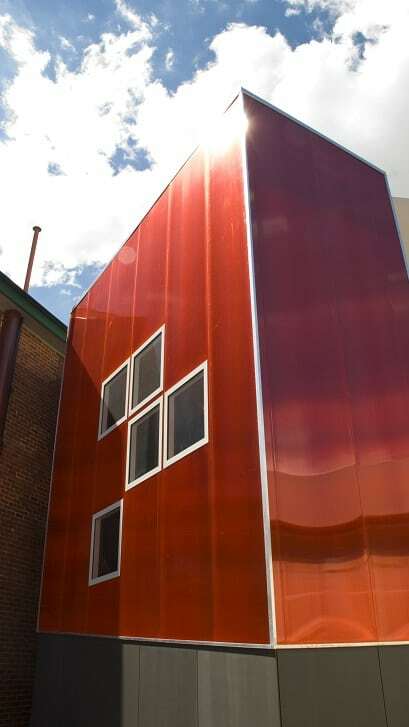 Danpal® Facades provide an array of finishes and effects that offer dazzling creative options. Compared to glass and other commonly used solutions, translucent facades offer much better value for money. They will stay in good condition for longer, and they’re highly secure. Unlike some other options, users won’t have to replace them very often. Indeed, they can remain in perfect condition for years. They also offer an environmentally-friendly alternative that doesn’t harm the planet. For more information, new clients just need to take a look at our brochure which is available on this site. You can then contact the team for advice and quotes. Our state-of-the-art systems were created with architects and designers in mind. That is why the products we bring to the market always meet expectations. The professionals working for our brand have decades of combined experience in this industry. We listened to the complaints of designers and building specialists before coming up with the perfect solutions. Make sure you take a look at our range and consider all the benefits before taking a single step further. Those who still decide to use glass or an inferior material will never achieve optimum results. Just take a look at some of the most attractive buildings in any city. We’ll bet at least some of them use translucent facade products. How are polycarbonate panels so much stronger than other alternatives? 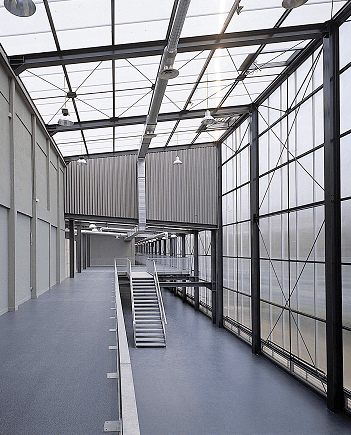 The market for polycarbonate and polycarbonate panels has developed in recent years. Largely down to the fact that people are looking for more environmentally friendly and energy efficient materials to be used on their structures. If people solely wanted to protect the environment, but the panels were expensive and not energy efficient, these polycarbonate panels would be nowhere near as popular as they are today. 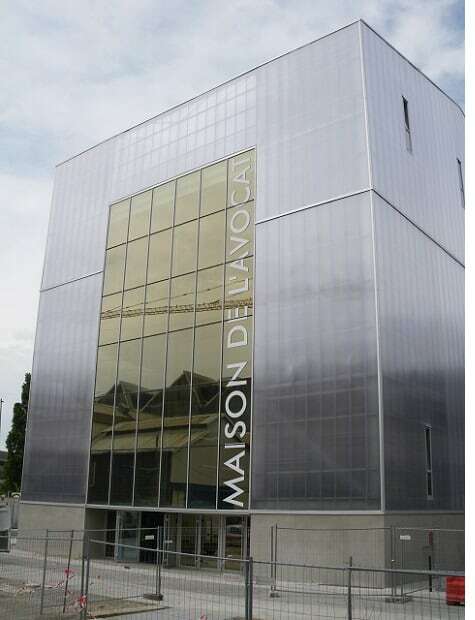 All across the world polycarbonate has been replacing the traditional building materials like toughened glass and polyethylene membrane across a wide variety of industries. This is largely down to the fact that they strike the best balance between high impact strength, being lightweight, frame resistance, anti-drop, light transmission and UV protection, all while still looking great from an aesthetic perspective. Clear polycarbonate is just as translucent as glass, but it is only half the weight which makes it a whole lot easier to transport and to install. 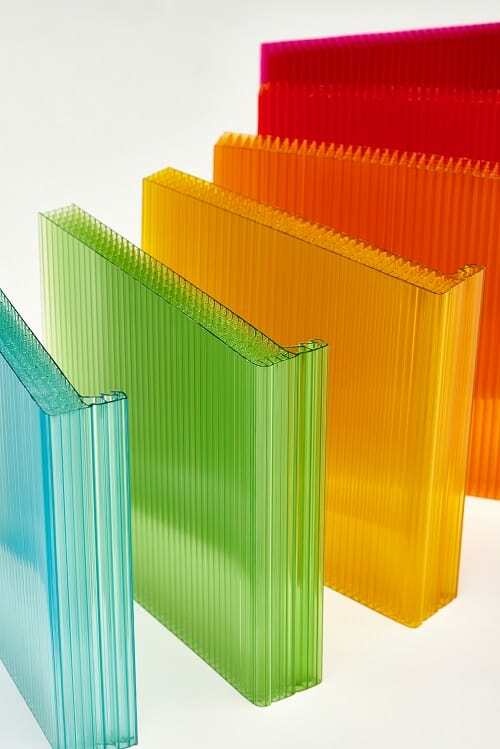 Test studies have shown that polycarbonate sheeting and panelling strength is approximately 200 times that of your usual glass and up to 20 times of tempering glass. This is why they are such a great solution for structures that are exposed to a lot of tough weather conditions like storm rain and strong winds. 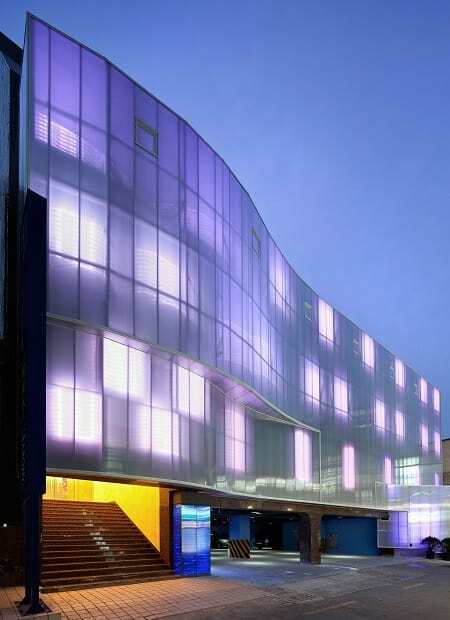 At Danpal, we have created a top of the line translucent façade system utilising polycarbonate panels to great effect. We have a specially designed rain screen system that is completely waterproof, which helps to preserve the integrity of a surface long into the future. As polycarbonate is so easy to cut and you have the flexibility to utilise it in many different forms, more and more architects are using it to come up with innovative and highly functional designs for the structures they are working on. The main area of benefit for many people is that they are top quality insulators. In this day and age, buildings make up about 40% of the primary energy consumption for most developed nations. This is why insulation is so important in terms of managing energy costs. Our system protects the insulation from external forces thanks largely to the natural ventilation in the facade as a result of the air gap. This means that there is a constant convective motion occurring behind these panels, which keeps the insulation nice and dry, as well as efficient in the long run. One of the key buzzwords when you are looking at the design of a building in this day and age is sustainability. This is sustainability in terms of environmental impact, energy efficiency, as well as durability. The owner of a structure wants to get the best bang for their buck in terms of the costs they are going to be paying for energy, as well as meeting and exceeding the environmental requirements that have been set out by the relevant authorities. One of the more exciting trends in the field of facade systems has been the development of certain facades that have the ability to eat smog. This is achieved through a treatment of a thin layer of titanium dioxide, which is a liquid or powder that can be applied to a facade system such as ours at Danpal and when the sun strikes this chemically treated surface, the process of oxidization begins of organic matter, meaning that pollutants will be transformed into carbon dioxide and water vapour. This exciting new development has already been experimented with in certain projects, such as that of the Manuel Gea Gonzalez Hospital located in Mexico City. This is near the top of the list when looking at the most polluted cities in the world. This is an exciting development and looks set to have a large impact way into the future. What stops us from coating complete cities is the material? This could be a stepping stone for all facade systems having air quality improvement features built in them during the manufacturing process, which could help to transform the environmental impact our buildings are currently having. When looking at the environment on a global scale, up to 40% of the energy consumed is by building, so this could go a long way towards decreasing the damage that is being inflicted by these structures. 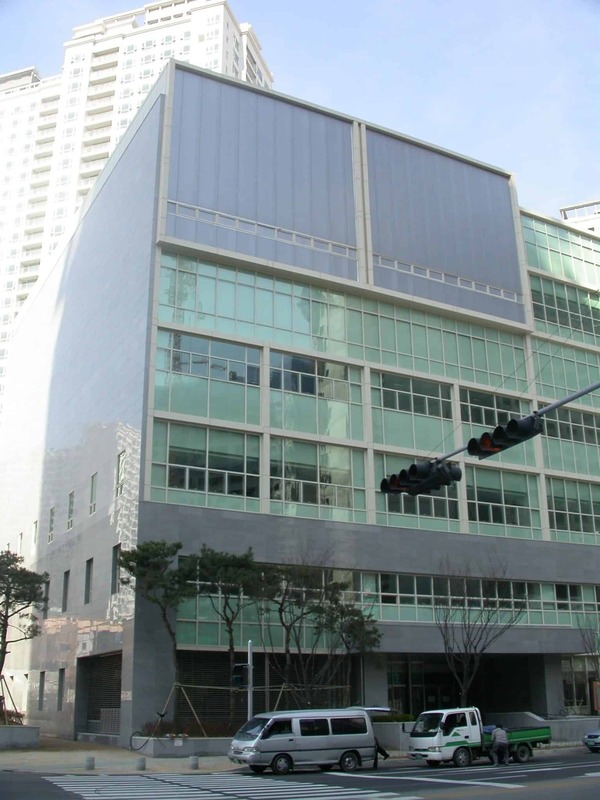 At Danpal, we have been focused on providing facade systems that are environmentally friendly. By using translucent faces, we are able to achieve a superior light diffusion. This means that not as much energy will have to be consumed when lighting up the interior of a structure. The high thermal insulation and great R values of our system means that less money needs to be spent cooling and heating up a building, as the facade system naturally takes care of lot of these issues automatically. When it comes to the facade of a building, there are a few different options that you have to choose from. Each will have their own pros and cons, depending on the situation at hand. One of the most important features that your facade needs to have is durability and resistance to external damage. There is no point having facade that will crack, scuff and break not long after it has been installed. Proper facade should last for decades, rather than looking faded and worn after a few short years. There is a fine balance that needs to be achieved when it comes to the facade while you want something that is durable and is very resistant, you also want something that is flexible and allows you a certain amount of freedom when it comes to the design specs. If aesthetics is something that is important to the project, you have to choose from different options, as some systems will be better finished than others and be much more elegant. You can also choose from systems that are transparent or ones that are made with a variety of alternative finishes. 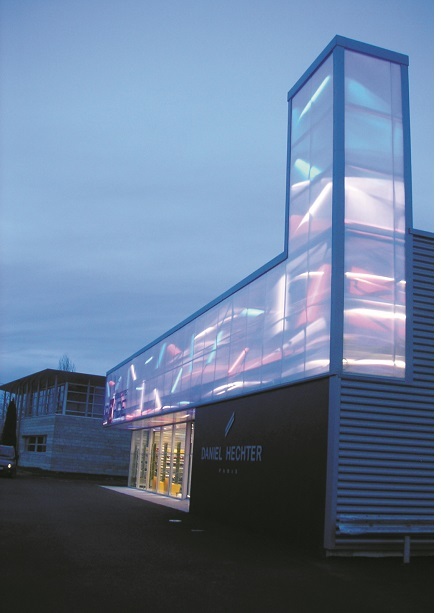 Danpal’s translucent façade system is one of the best in the business. 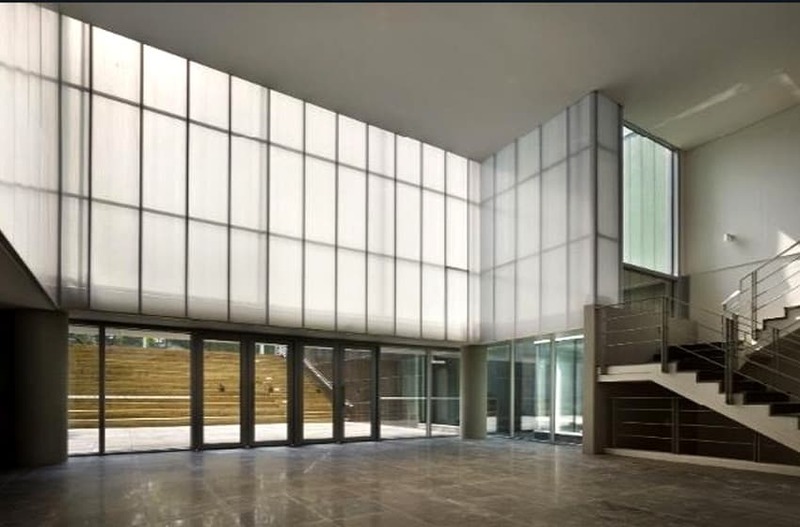 Compared to many of the alternative on the market today, the Danpal facade has superior light diffusion, which means that the natural light is evenly diffused. Its specialized design is perfect for daytime applications and it looks aesthetically pleasing thanks to the tightly spaced ribs. As it offers a lot of flexibility when it comes to design, it is also very easy to install and tweak towards your desired goals. 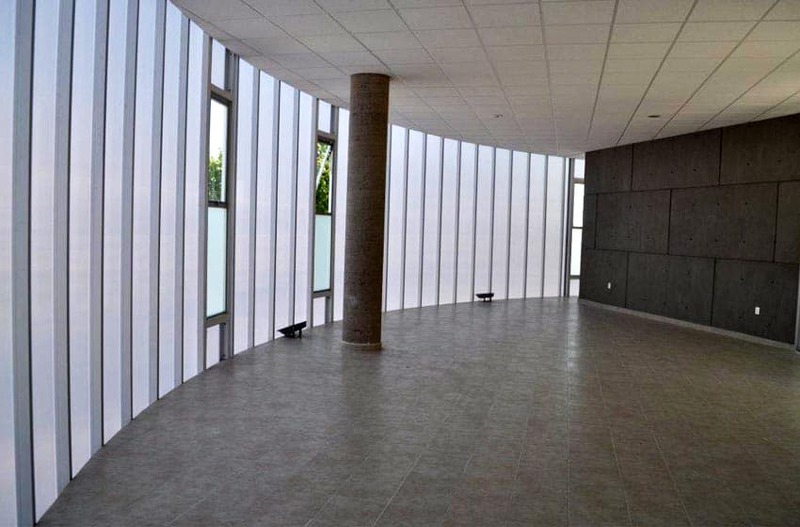 The concealed joints have the ability to twist and warp if needed and the building design professional will be able to control how much light that is coming through, create amazing visual contrasts, as well as hide certain unappealing elements of the building. One of the most important features of facade is that it helps to protect the building from external elements such as the weather. The last thing you want to happen is to have a facade that looks amazing, but as soon as the wind and the rain comes, you are faced with all sorts of problems. Danpal’s translucent facade have top quality air and water tightness. This is thanks to the snap-lock connection which makes sure that these types of elements cannot enter the building when they are unwanted. When it comes to adding the finishing touches to a new building or even to spice up an old building, there are so many different textures, colours, fixtures and lighting effects available to you to create truly amazing and inspirational facades that you are truly spoilt for choice. You can tailor your needs to your desired look by day and your desired look by night. Finally, as with all systems form Danpal, the security is seamless thanks to the double click locking seam and you will also be able to protect your skin from harmful UV rays, as the systems all have top quality co-extended UV protection built in. If you are designing housing units, there is usually a certain amount of restriction placed upon you when it comes to expressing yourself creatively. Usually, cost will play a significant role in what sort of design work you can do and features that you can add. By carefully choosing the facade materials, you are able to transform even the most boring and normal looking house into something that has style and substance to it. It is all about finding that right balance when it comes to the key features. Perhaps the most important part of choosing the facade is deciding what style you are going to use. There are so many different variations and styles catered for in the market today that it can be hard to nail down one choice. You want to give the housing some personality and a unique style that will make it appealing to the home owner. Is your preference more towards minimalist, traditional, contemporary or modern styles? The list goes on. You need to factor in what sort of look will suit the surroundings and general location of where the homes are going to be. Every designer will have certain materials that they like to use over others. You want to use materials that are going to stand out. You can find inspiration by driving around other housing estates in the area and seeing what works well, as well as what doesn’t. This allows you to learn from other people’s mistakes and failures, as well as seeing the image in your head somewhat brought to life. Which colours are representative of your design? You want to choose colours for the facade that are easy to manage (i.e. easy to clean), as well as tying in with the design of the rest of the house and developing an aesthetically stylish finish. You can even use different shades of the same colour to give off a layering effect that has some depth to it or you could go for a bold look that contrasts different darks and light colours along with varying textures. In order to complete the look of a house, it has to fit in with its surroundings. You can have the most beautifully designed house in the world, but if it doesn’t fit in, then it will not look right. You can utilise things like columns, feature lighting and brick stacks to make the houses stand out. 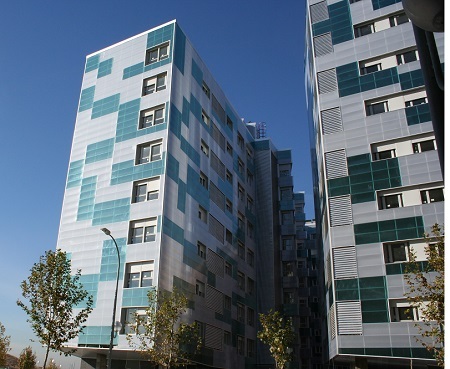 Danpal has a variety of different facades that have different facade materials being used. Whatever you are looking for, the team at Danpal can cater for your needs. There are so many different textures, colours, and iterations to choose from, you will be sure to find something that fits your eye and the project at hand. What is great about their facade options is that they are lightweight, while still being very resistant to outside forces, meaning that they will last a lifetime. The benefits of daylight in public buildings are many, including a positive effect on mental capabilities of the people who work and conduct business there, as well as the potential for saving energy. However, with that said, it is not enough to simply place a large, glass window on one side of a room and make the assumption that it will provide natural light for a room. 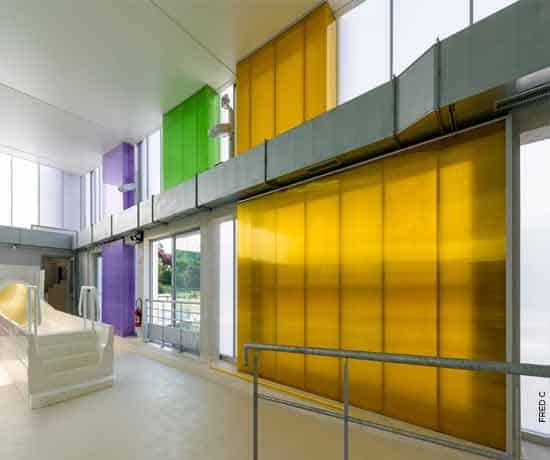 Danpal translucent façade material offers an intelligent alternative to the plate glass window, with all of its attendant problems. While windows increase the amount of light in a room, they can also create glare and solar gain. Without careful planning, a large glass window can flood a space with painfully bright light and can act as a lens that will increase the amount of heat in a room. Because of these two factors, people who work in spaces that have large, glass windows frequently add window shades and curtains that can obviate the benefits of having a large expanse of transparent material capable of admitting natural light. The result is the classic office or large living space that is rendered dark and gloomy thanks to heavy curtains. Furthermore, in warm climates, the energy savings of having natural light is heavily offset by added air conditioning needed to compensate for excessive solar gain. One might think that because of the ability for a glass window to warm up a room, that it would be an ideal situation for colder climates where daylight is minimal at certain seasons. Sadly, even in the winter months when daylight is admitted for shorter amounts of time, simple window glass has some serious drawbacks. Although it heats up a room during the day, it also allows heat to escape back out of the room – particularly at night. Furthermore, at certain times of the day – frequently at daybreak or at dusk, the lower angle of the sun’s rays can create a blinding glare in rooms where windows face either east or west. Here, again, inhabitants will use heavy curtains to cut the glare or they will use insulated drapes to minimize the natural heat exchange capability of glass. Danpal translucent facades are a smart and attractive alternative to the traditional glass window. First of all, they are translucent, rather than transparent. This immediately cuts down on the glare, and it also provides a modicum of privacy for desk workers while still admitting natural sunlight into a room. The translucent panels create a more diffuse light that creates a pleasant glow conducive to reading, writing or quiet conversation. Second, Danpal also creates panels with operable shade functions so that people can adjust the settings to personal comfort levels without completely shutting out natural light. 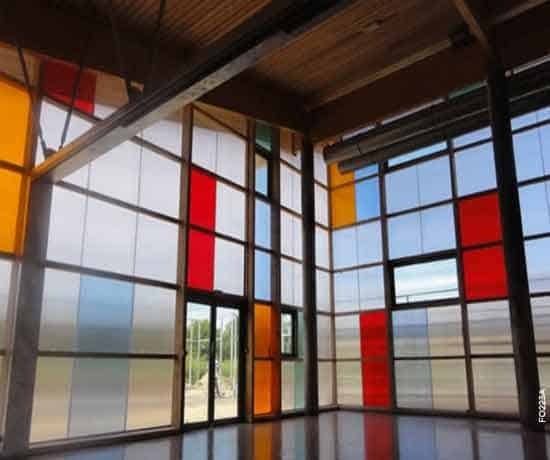 These translucent panels can create a variety of colorful effects that lend interest to the building as well as comfort to workers, customers and others who might be inside. More than that, the translucent facades come with UV blockers, which keep out the harmful parts of the sun’s rays, and well as toning down the heat index that is so characteristic of plain window glass. This allows enjoyment of natural light without the harmful potential for sunburn, skin damage or glare. One might ask, if natural light through windows has so many problems, why should we bother with it at all. The answer is that, even with all of the attendant difficulties, natural light has been shown to convey many benefits. Humans are primarily diurnal. That is, we are set up to function best in the daylight hours. Daylight not only make it easier for humans to see, it has a positive effect on the pineal gland – and organ modern science is only just beginning to understand. School children who are exposed to natural light for at least fifteen minutes per day – and more is better – tend to be more able to focus during class time, producing better school work and correspondingly good grades. Hospitals have found that patients who have undergone surgery have a better recovery rate when their rooms are open to an outside view and when they are exposed to natural, rather than artificial, lighting. Natural light or light therapy has even been shown to have a positive effect on Alzheimer’s disease patients, particularly the ones who have difficulty sleeping at night. When the light was administered in the morning, it was found that it reduced aggression sometimes displayed by some Alzheimer’s patients in the afternoon. For the rest of us, sunlight is simply uplifting.